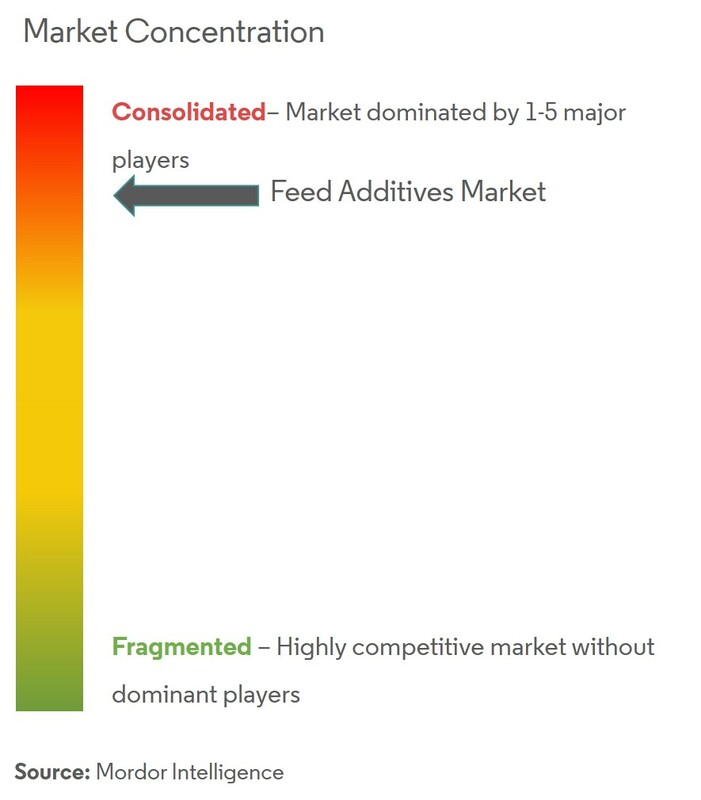 The Global Feed Additives Market (henceforth, referred to as the market studied) is segmented by Type, Sub Additive Type, Animal Type, and Geography. Feed additives are essential for animal nutrition, as they improve the quality of feed, and thereby improve animals’ performance and health. Industrialization of the livestock and meat sector is an important factor driving the demand for feed additives across the world. Amino acids, antibiotics, organic acids, and vitamins are the major segments, accounting for more than 40% of the global feed additives market. The determined push from the EU for alternatives to antibiotics has led to increased consumption of acidifiers and probiotics in Europe. The poultry segment is the largest consumer in the market studied, and the present trend of consolidation and backward integration of poultry processors is expected to maintain a steady demand for additives during the forecast period. The feed additives market is highly concentrated, with the top ten companies accounting for more than 50% of the market share. The leading players in the market studied are focused on business expansion. They are targeting countries in Asia-Pacific for business expansion, by either investing in new production units or acquiring established small players in the region.